.Juxtaposed; Stand on my Art! The artist Carl Andre made floor sculptures out of standard industrial materials such as bricks or metal plates in simple arithmetic combinations which he very much encouraged the public to stand on, walk on and physically interact with. His work was created using everyday household and factory-made materials; this was a very purposeful point the artist was making, be part of the art, art is everywhere, art is what you make it. Initially when his work was first shown at The Whitechapel Gallery in London, many visitors were shouted at for standing on ‘The Art’ even though that was the point! We are far more aware in this day and age regarding which pieces of art we can physically interact with, touch , walk over and around or even play in. But do we still feel a little uncomfortable with that idea or even do we feel weird when we put our feet on something that is as precious as a Persian rug? Paris Essex the knitwear due have created a selection of blankets (but could so easily be a wonderful rug) that you can stand on wrap yourself in. They revisit the craft and clichés of knitting and crochet, playing with hand and machine techniques to create unique playful knits without a sell-by date. Vivid in colour, texture and pattern yet they come with more than a pinch of humour. Founded by Carolyn Clewer, the Essex girl and Parisienne Tiphaine de Lussy, Paris Essex is the result of years of collaboration between the two knitwear and textiles specialists, which began 29 years ago at the Royal College of Art. 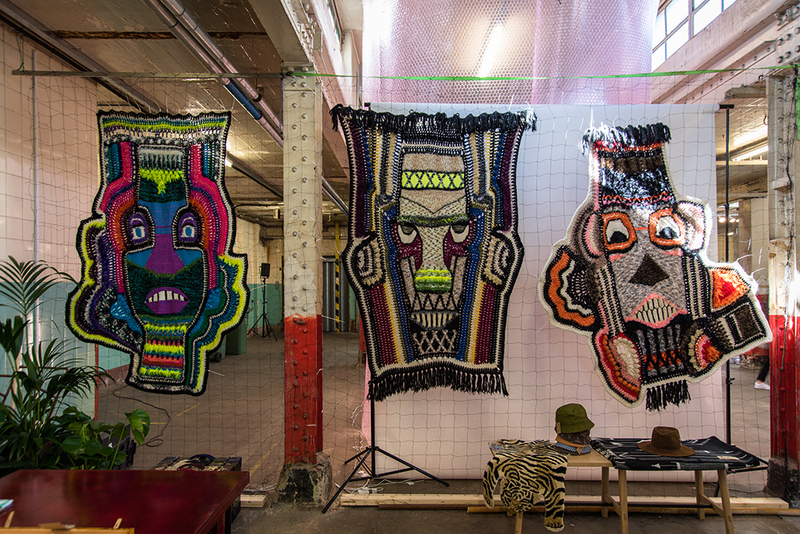 Paris Essex’s “Crazy Blankets” represent a creative dialogue between Clewer and de Lussy; the two take it in turns to play with crochet and knit, using mohair, wool and super-synthetics. Each blanket takes on its own personality as it grows organically and fluidly, with a process more akin to collage or patchwork than meticulously planned design. With names such as “Heebie Jeebie” “Zig Zag Bunny” and “Miss Harlow” each blanket tells its own story, mixing in patterns, shapes and characters. They make the perfect ‘blanket art’ albeit one you can have no fear of interacting with.